Former Arsenal striker Nicklas Bendtner has been sentenced to 50 days in jail after being convicted of assaulting a taxi driver. The Denmark international, who is now with Norwegian club Rosenborg, broke the jaw of the taxi driver following a night out in Copenhagen back in September. A court in Copenhagen watched a video of the incident filmed from inside the cab. Bendtner, 30, will appeal the sentence having previously apologised. He was able to walk free from the courtroom because the appeal is pending. Rosenborghave stood behind Bendtner despite expressing their disapproval of his actions. ‘We think that it’s not good for the club and not good for Nicklas, but he remains a player in the club. We are keeping him,’ Rosenborg CEO Tove Moe Dyrhaug told Reuters. Bendtner was charged with beating and kicking the cab driver in the 2.41am incident on September 9 after he and girlfriend Philine Roepstorff had been at the exclusive nightclub Lusso. Having quarrelled over the £4.80 fare, Bendtner punched the driver in the jaw before kicking him as he lay on the ground. The argument started when Bendtner, who admitted he had been drinking, told the driver to ‘keep left’ only for him to turn left. As tensions escalated, Bendtner claimed he felt threatened and left the taxi for his own safety. The pair then squared up on the pavement, with Bendtner claiming he hit out in self-defence when the driver moved towards him. 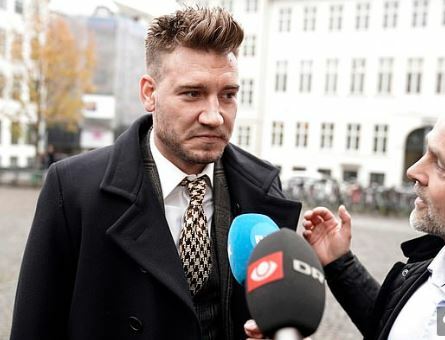 Bendtner admitted hitting the driver but claimed it was in self-defence after the argument over the fare led to the driver throwing a can or bottle in his direction. Bendtner has been handed an unconditional sentence and told to pay the driver £1,330 in compensation. The cab driver was acquitted of violence but fined £355 for using his telephone while driving and not wearing his seat belt.